To all of you I have only two words: Arjun Hingorani. 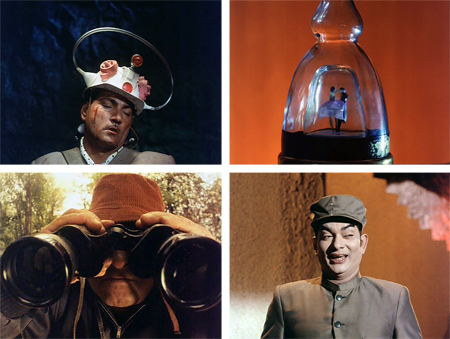 I have seen a few films in the month since I last posted a review, but as nice as some of them were they simply didn’t inspire me enough to overcome the cloud of Callie-worry and work overload. I was positive that the letter ‘K’ loving Mr. Hingorani would have something up his sleeve to make my eyes pop out. And so he did. He always does. 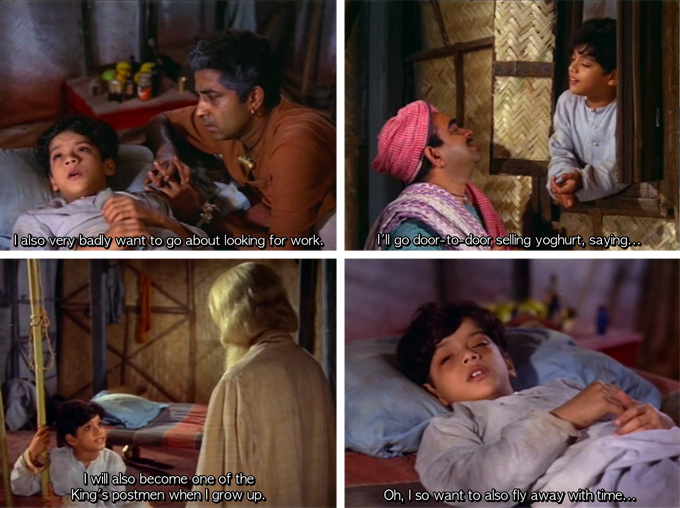 This is a very unusual and bittersweet film based on a Rabindranath Tagore story about the last few days of a dying boy named Amal (an unforgettable Sachin). Produced by the Children’s Film Society, I suppose it can be categorized as a children’s film, although as with most good children’s movies it is entertaining for adults too and a little bit dark. Children may not entirely understand what’s going on, although in my personal experience they understand a lot more than adults give them credit for. The movie weaves together fantasy and reality as lonely Amal—trapped inside the house by the local pandit-doctor’s (AK Hangal) orders—chatters with an assortment of passersby and villagers, and daydreams about venturing forth and seeing the world beyond his horizons. As the story unwinds fantasy gradually takes over from reality as Amal fades, much to the distress of his adoptive father Madho (Satyendra Kapoor). The sets are deliberately “stagey” and candy-colored which enhances the fairy tale effect, and the photography is lush, with lovely music by Madan Mohan (lyrics and dialogue courtesy of Kaifi Azmi). 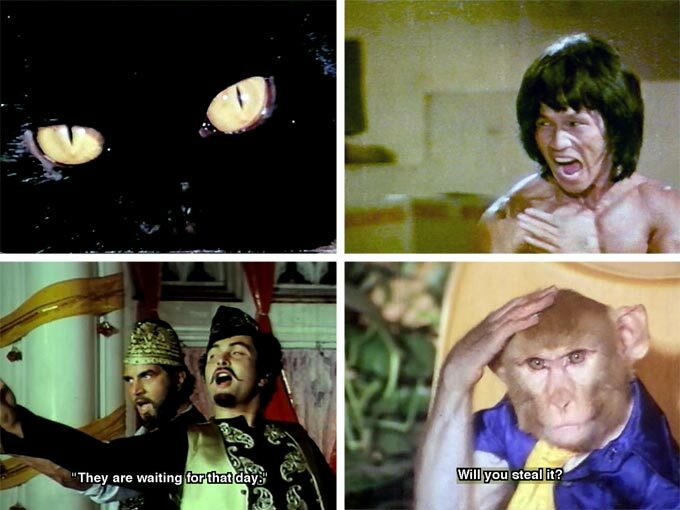 I must above all thank Raja for subtitling this for me—if anyone has this film and would like the subtitle files, please let me know and I’ll send them to you. Thanks Raja! This is my least favorite of the Mehboob Khan films I’ve seen, and it is such a pity. It boasts a fine cast with excellent acting, absolutely gorgeous music, stunning cinematography, detailed sets and costumes. The visuals, the ambiance and the characterizations all convey a wild Romanticism, but the plot collapses into an unholy mess halfway through. The pivotal event around which it revolves is completely incongruous with the characters we have come to know (not to mention that I have a serious quarrel with some of the resulting fallout). It feels like Mehboob didn’t show up at all to work on the second half; it’s as if he realized that he was confused about what he was trying to say, knew he had screwed it up, didn’t have the energy to care, and finally just gave up. and make them into films which lull you into an uncomfortably bored stupor: uncomfortable because you are really justifiably afraid that if you fall asleep you will miss something truly wondrous. When I see his name in the credits, I am happy and sad. I adore Mr. Nagaich, truly, but he SO disappoints me. It’s confusing, almost as bewildering as his ability to convince audiences that his actors are dancing. 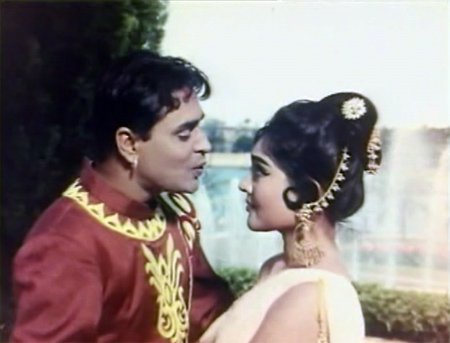 Tags: Agha, Babita, Jeetendra, Kanchana, Laxmikant Pyarelal, Mohan Chhoti, Mukri, Ravi Nagaich, Sajjan, why isn't this good why? 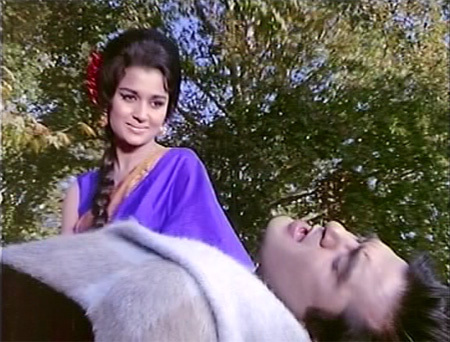 This Sharmila Tagore home production took years to make and it shows, mostly in Rajesh Khanna’s hair. But it’s sort of fitting, actually, because the story itself takes place over years—as do all of the Sharmila-Rajesh movies, with lots and lots of suffering and noble sacrificing principles (tyaag!) along the way. This is full of all that, but still I enjoyed it: sometimes angst is not misplaced and human frailties can cause a lot of trouble. I will say that the subtitles leave a lot to be desired—they are patchy in places (long dialogues with short or no subs) and hard to read at best. My friend Suhan did her best to fill in the gaps but even so a lot of the dialogue went over my head, making the film much less meaningful for me I think than it might otherwise have been. 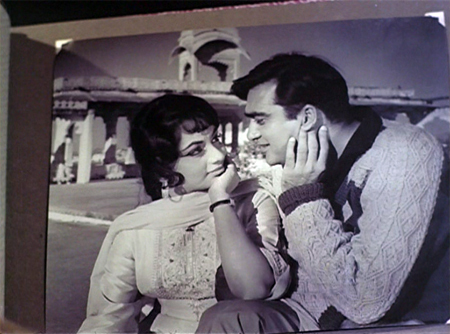 The music by SD Burman (his last soundtrack) is also very pretty indeed (my favorite is the duet “Hum Tum Hain Tum Hum”). Oh, how I loved this film. It is an absolutely riveting and heartwrenching story, with fine performances and stunningly beautiful songs (Roshan’s last—the film is dedicated to him). The background music is superb too, by Salil Chowdhury; and the black and white cinematography is lush and gorgeous, with richly patterned detail and stunning closeups of the characters. I am running short of superlatives! The message is nothing new (see screenshot above) but the treatment—nuanced, balanced—is unusual. It is interesting to see actors I am less familiar with, too. 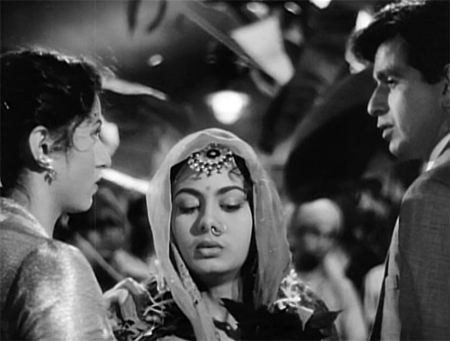 Zaheeda, the heroine, is a niece of Nargis and Anwar Hussain (also in this), and she looks so much like Nargis sometimes that it’s startling. And Parikshat Sahni (son of Balraj, whom I just saw as Farhan’s father in 3 Idiots) made his debut with a central role here: such a natural actor, and so handsome too! 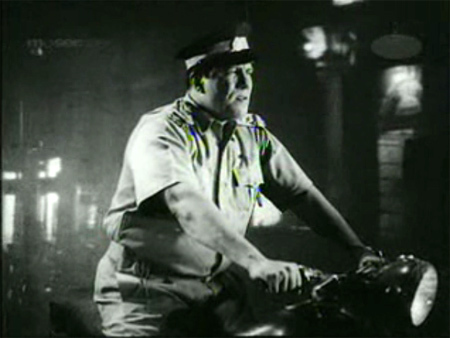 Tarun Bose, Aruna Irani, Anwar Hussain, Badri Prasad and Mukri add able support as well. 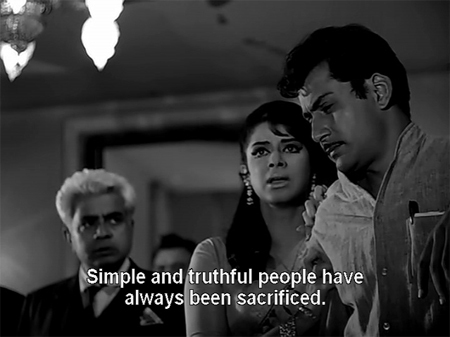 But the film really belongs to Sanjeev Kumar as a simple and sweet villager who is transformed by events into a dacoit with a big price on his head.